Many metrology applications require equipment, machines, structures, and foundations to be both flat and level. One example is aligning carts and rails that are used to transport heavy materials. The ability to accurately measure gravity and keep track of level throughout repeated instrument moves and part alignment operations can be a critical component in a measurement job’s success. Understanding the underlying principles and tools in SpatialAnalyzer can help users utilize SA for many level measurement applications. It is important to understand the fundamental difference between the terms “flat” (or planar) and “level” with respect to gravity. Flat refers to a planar property and measurements of flatness, parallelism, and perpendicularity can be accurately determined and perfectly described in a Cartesian coordinate system. Level, on the other hand, is a measure of orientation relative to the earth’s gravitational pull; it is a directional measurement that depends upon the location on earth where the measurement was taken. If a measurement job encompasses a small area such as a shop floor, multiple measurements of gravity will appear nearly planar. For this reason, it is often helpful to use your instruments to determine a single level reference at a particular location, or an average of several level measurements, and then consistently reference this level plane throughout the job. Another point to consider is that some measurement devices have built-in level measurement capability, while only a subset of those actively compensate measurement back to level. For example, theodolites and total stations typically level compensate measurements, while laser trackers can have levels but they don’t compensate the measurement back to a level plane. There are several instruments that offer options to do both; so it’s important to know when to choose the option that is most appropriate for your application. Level compensators automatically adjust measurements relative to the gravity vector. They always have the gravity vector as the zenith, which makes the horizontal plane level to gravity. This happens in the instrument before the data is sent to SA. Most laser trackers don’t use or have a level compensator, so they always report data relative to the standing axis of the instrument. In most cases you can measure the difference between the standing axis and the gravity vector. SA represents that as a Frame where the Z-axis is aligned with the gravity vector. When you make the frame the working frame in SA, measurements are reported relative to a level plane. 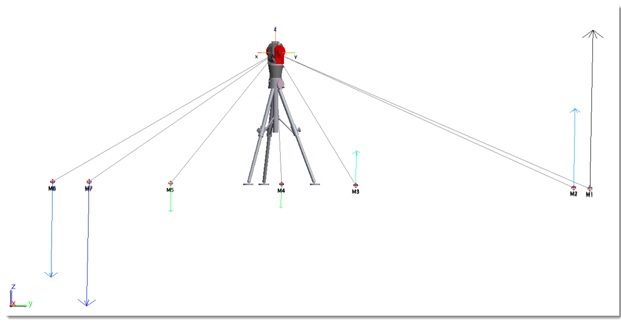 The difference between level compensated and standing axis instrument models can be seen in SA as shown in the figure below. The instrument model above on the left is using level compensation, so the data is automatically aligned to gravity. The instrument model above on the right isn’t using level compensation, so its data is shown relative to the standing axis. Note that the points are the same, but the instrument models are in different orientations. This difference is often very slight, but can be clearly shown in the graphic above since the angular difference is exaggerated by 20⁰. A level measurement is inherently a planar measurement where the plane’s normal vector is aligned to the gravity vector. When measuring level with an instrument (without a level compensator), SA creates a frame at the instrument’s origin where the Z-axis is aligned with gravity. This measurement is made relative to the instrument standing axis. When the measured level frame is made the Working Frame, the station’s measurements are reported relative to the level plane centered at the station. SA automatically associates the level frame to the instrument model. That association means when you locate the instrument relative to the object being measured, the measured level frame automatically moves with the instrument. Measure a set of points on key features of the object. Use the Instrument Interface’s function: Devices >>Level >>Measure. A level frame is constructed at the origin of the station. Start SA’s Frame Wizard: Construct>>Frame>>Frame Wizard. Select the Z-Axis of the Measured Level Frame as the primary axis control. Select key feature points on the object to define either the X or Y axis direction. Select a key feature on the object as the Frame’s Origin. Make the new Leveled frame the Working Frame. Measure at least three (preferably six or more) easy to see target locations to use to align/locate new stations to the gravity reference. Aligning New Stations to the Gravity Reference Level Frame—When a new station is added to a job and it doesn’t have a level compensator, it needs to be aligned to gravity reference or Level plane. There are a number of techniques to get it gravity aligned. Locate the station using at least three or more points that are known relative to the gravity reference. Measure a Level Frame from the new station and do a Locate>> Frame to Frame using a known Level Frame as the Reference and the newly measured level frame. Use a Relationship Fit to locate the station relative to level points and features on the object. Transformation Degrees of Freedom— After a station is set up and leveled in SA, it has to stay leveled. The degrees of freedom control section in SA’s transform dialogs provide the tools to hold level during alignments. They work by restricting motion relative to the working frame, not the individual instrument’s frame. Therefore, to prevent rotation of the instrument relative to its own gravity measurement (Rx and Ry), you must turn off Rx and Ry when solving for the transformation to prevent the instrument from rotating off its gravity reference. Otherwise, the rotational axis of the instrument will change and the level constraints will be lost. Straightening Instruments—it is important to align an instrument with the current level working frame to ensure that correct degrees of freedom are constrained during the alignment. In SA, this can be accomplished using either one of the Instrument>Straighten commands. There are two separate commands depending on whether or not your instrument has an active compensator. Instrument>Straighten (make Z-axis align with working frame)—this provides a quick way to orient a compensated instrument or the instrument model with the working frame. Instrument>Straighten (align level frame Z-axis with working frame)—This command was recently added to provide an easy to way to use the level measurement taken by an uncompensated instrument and rotate the instrument so that its level measurement is aligned with the working frame (not the model frame). This command can operate on any frame associated with an instrument (by using Instrument> Object Associations> Associate Objects with Instrument). This can be used to align a station(s) to an averaged level frame, if needed. Checking the position of your measurements directly: The biggest advantage to having the level measurement frame tied to the instrument is that it moves with the instrument station as the instrument is moved in the job file. Multiple instruments can be moved, adjusted, and aligned as necessary without the threat of losing the level measurement relative to the measured points. At any time, a level frame from any instrument can be set as the working frame and in doing so, the X, Y, Z position of all points or objects measured by that station in the job will be updated to report relative to this new frame. With the level frame as the working frame, the Z heights of points or objects can be directly compared to determine if they are level relative to each other. Comparing measurements to a level plane: It is often required to compare a set of measurements directly to a level plane to determine if the part is level and determine the individual measurement deviations from this level plane. To do this, follow the simple procedure below. Measure your part and take a level measurement (Devices>Level>Measure in the instrument interface if you don’t have a compensated instrument) or simply build the instrument model frame using Construct>Frame>On Instrument>Base if the instrument is compensated. Make this level frame the working frame in the job. Fit a plane to the points and built its centroid cardinal point. Use Construct>Plane>Normal to Object through Point (selecting the Level Frame measurement and the center point of the fit plane for its location). This will build a level plane at the centroid of measurements for your reference. Use Query>Points to Objects toselect the measurements and the level plane to build a vector group displaying the point deviations from level. Best-Fitting and comparing measurements to a nominal data set while holding level: Another common scenario is to compare measured points directly to nominal points while holding the instruments level, or leveled Best-Fit. A simple method to accomplish this is below. Import the nominal points into the job file. Data is imported relative to the working frame, so be sure to set the frame representing Level in your job (such as world) as the working frame before bringing in the points. Measure the nominal points and take a level measurement (if you don’t have a compensated instrument) or just build the instrument model frame using Construct>Frame>On Instrument>Base. Use the appropriate Instrument> Straighten command to align the instruments gravity measurement with the working frame. Right-click on the instrument and select Locate>Best-Fit, then turn off Rx and Ry in the Degrees of Freedom section when you perform the fit. The instrument’s level can be held in this way for most alignment operations in SA, such as relationship fitting and even USMN.